With immense pleasure, we are proud to tell you that one of our Offline Students, Sai Kiran D N, has secured AIR-52 in IFoS, Civil Services Examination, 2016. Sai Kiran joined us for the Mains Offline batch 2016. He was one of the two guys who wrote IFoS Mains from IASbaba. He was a very sincere and dedicated student, was very regular to all the classes and tests. I reached Delhi after resigning Job in TCS (Chennai) to pursue civil Services. Because I always believed that more than a job, love to do service, which I got deeply influenced and nurtured from family staying at Tirumala,Tirupathi. It all started with this single step i.e. “To Serve”, I really wanted to give a good try to this exam as it is said that “ You Never failed, You Never tried” .But I am happy that failure thought me best lesson, probably success couldn’t do. One thing was clear in my mind that I should do my “karma”, so I kept working hard. Prelims exam is all about thorough knowledge in subject and application with high accuracy.This can be possible with maximum revision exercise and practicing MCQ’s in exam centre like conditions. (I solved many question papers and IASBABA has one of the best quality) .In test series it is better to follow elimination method (which worked for me to get around 140 in 2016 prelims). Read limited books and revise them at least three times before examination including current affairs. A fair mixture of current affairs and static subject is must for examination. One should not neglect English language paper, it can be game changer in the exam ( marks are counted). Practicing essay, report and letter writing and most importantly precise writing can help to get better marks. General knowledge paper do not require any new reading, a track of current affairs along with revision of prelims syllabus would be sufficient for most of the questions. High Marks in GK and English papers can increase chances of selection…. My optionals are popular Jodi Forestry and Geology…And my optional in CSE is geography(but not much helpful in geology ? Paper – I ,Section-A Indianforestry book by manikandan…..If time is constarint than section b with technical portion of silviculture can help in getting good marks. *** below app can be useful? in trees uses. Forest Management and Management Systems- should read in combination with silvicultural systems and mensuration. Section- B …Economic value of? forests and how to protect forests can be learnt from this section…Current affairs should be added to get good marks…. Section-A ….First start with mineralogy and their properties , later in each section major focus should be on rock composition , structure, their formations…..
(i) Mineralogy… Difference between different groups and examples. Section-B along with Internetsearch try to add good examples ..
v) Mining Geology….Cover the mineral policy and new initiatives from govt website…. These can be used in examples……Individual topics are also available in YouTube. Prepare synopsis of some important topics like rocks, structure, fossils and their formations, acf/akf diagrams, phase diagrams etc for quick revision….And of previous question papers without fail…..This notes can help in fetching better marks…. 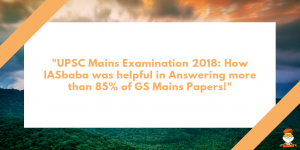 IASbaba, a unique team which is delivering quality out put which is perfectly oriented towards UPSC’s changing trend.I started following baba during prelims 2016 preparation and took the online test series which helped me to get good score, later joined offline mains and geography test series which helped me in forest service examination also……It is not a regular classroom? structure but emphasised more on individual interaction and attention which made baba as a true GURU. I thank almighty, teachers, grandparents, parents, and friends for being there with me during this beautiful journey…..